The 6 x 4" Ultra Contrast 1/2 Filter from Tiffen helps to open your shadows by using the ambient light surrounding the image area as well as the light in the actual image itself. It lowers contrast uniformly throughout, with little or no loss of sharpness within the scene, even where there are varying degrees of brightness. Shadow areas will reveal more detail but without any flare or halation from direct light sources or bright reflections. The Ultra Contrast works similar to a Tiffen Low Contrast filter with the difference being that it reduces contrast throughout the entire image whereas a Low Contrast filter will only open the shadows. 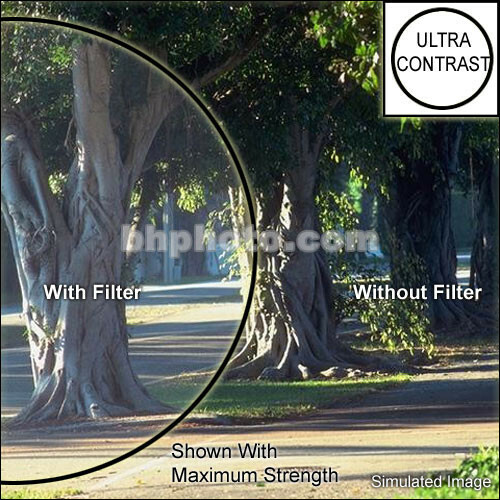 The 1/2 Ultra Contrast filter continues the process of opening your shadows while the image still remains sharp. Contrast continues to be evenly lowered but since shadow detail is now increasing you also begin to see more of the image.